Along the roadways are such oversized statues as Paul Bunyan’s Girl Friend, Lucette, as well as The World’s Largest Ball of Twine Made by One Man and a bas-relief carving of two grasshoppers genuflecting at the feet of the Virgin Mary. 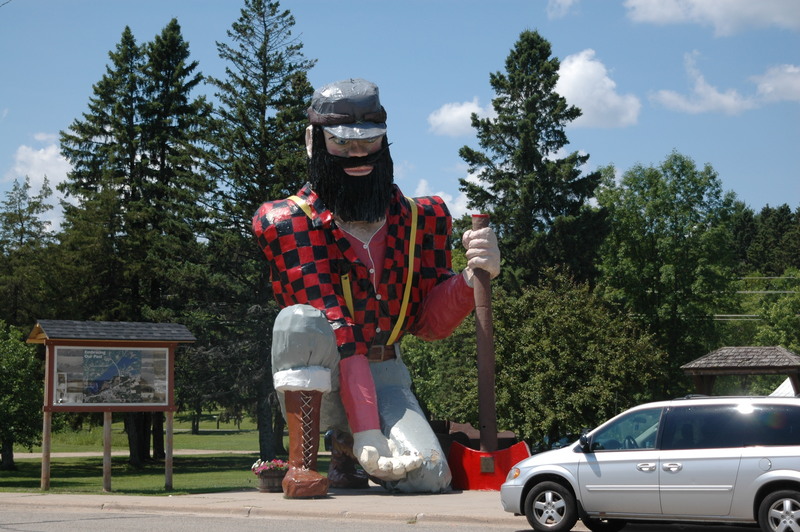 In the tiny town of Akeley, there’s the World’s Largest Paul Bunyan Statue, across the street from Paul’s Purple Cow Ice Cream Parlor and Eatery and Babe’s Cut & Curl. In Hackensack, local chroniclers report that in 1991 a high wind toppled Lucette’s head, and when residents repaired the damage, they surprisingly discovered she was pregnant with Paul Jr., who now has his own statue.….